Use the Smooth operation to smooth a horizon. The operation performs a moving average across the surface, with settings to allow weighting in a specific direction. This operation does not smooth across gaps; a point is only affected by adjacent neighbours. Where is the smooth (horizon) operation? Note: The Smooth button is disabled if the input horizon is waiting for another operation (such as propagation). Insight notifies you to complete the previous operation before continuing. 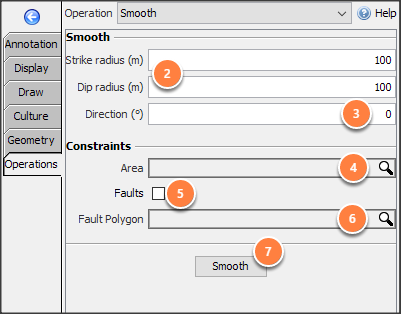 Smoothing is found in the Map View, under the Operations tab (along with other horizon operations). In the navigation bar, select the horizon to smooth. 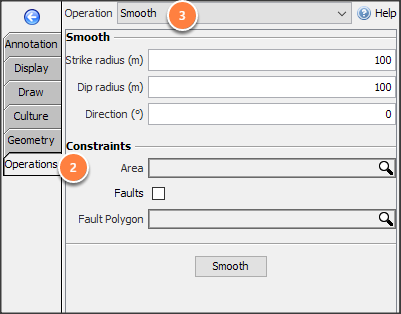 Strike and Dip radius: Enter smoothing distances. Use different strike and dip values for elliptical smoothing. Direction (degrees): The azimuth of the strike axis, in degrees (clockwise from North). This has no effect if strike and dip radius are the same. Faults (check box): If enabled, smoothing will stop when it reaches a fault(s). 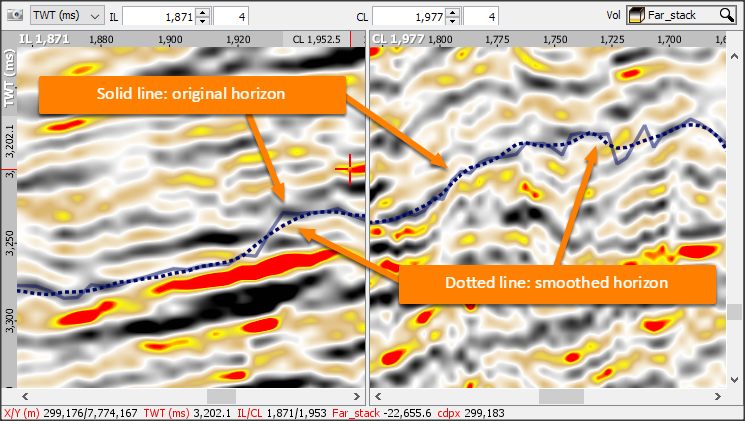 Fault Polygon: Smoothing will not extend through fault polygons (if selected). Click Smooth to start the operation. Note: By default, the new horizon will be named: “horizon_name (smooth strike radius x dip radius)”. For example, the operation above will yield a new horizon called "Sample (smooth 100 x 100 m)". To rename the horizon, see Horizon Details and Configuration.